Lee Israel’s droll memoir is so riveting it’s easy to see why it was adapted into a movie (starring the brilliant Melissa McCarthy). In the early ’90s, after a successful career as a biographer, Israel—broke and often inebriated—began forging letters from luminaries like Dorothy Parker and Noel Coward. And she committed her literary crimes with enough wit, verve, and intentional typos to turn a handsome profit. It’s fun to try and separate the facts from fiction: Was Coward really irritated by Marlene Dietrich? Did Parker actually describe a hangover as “a real museum piece”? Although Israel couldn’t dodge the FBI forever, her unrepentant retelling of her crime spree creates plenty of suspense. SignatureReviewed by Edward DolnickForgery is a strange crime because, until the police show up, the victims never know they ve been done wrong. Muggings and thefts leave no such doubts. Even so, forgers themselves are seldom captivating figures. Reliant on the artists they imitate, they give off only reflected light. Lee Israel specialized in forged letters. 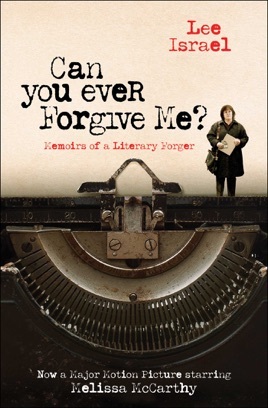 Over the course of two years (1991 1992), she churned out hundreds of brief letters supposedly written by the likes of No l Coward, Lillian Hellman, Dorothy Parker and a host of lesser names from the suburbs of celebrity.Most of the letters are mundane. That sounds like trouble, but Israel knew better. Her buyers didn t mind. They didn t want art; they wanted the whiff of authenticity. A few homey sentences only strengthened the illusion. Once Israel had tossed in a tiny joke and added a bold signature, she was home free. I loved your flowers, thoughtful boy, Edna Ferber supposedly wrote to an unnamed acquaintance. They were waiting impatiently for me when I returned from Main Chance. But Israel overreached. When she turned from peddling her own fakes to selling genuine letters she had stolen from libraries (after substituting her forgeries), the FBI came calling. She tells her story briskly at 128 small pages, the book is thin to the point of anorexia and devotes more time to self-mockery than self-justification. Israel had learned to recognize a grabby letter in the course of researching celebrity biographies. She produced books on Tallulah Bankhead, Dorothy Kilgallen and Est e Lauder, then fell on hard times. She conned her way back to financial respectability by peddling gossipy, scandalous forgeries to spectacularly incurious dealers. Crime hardly gets more small-time. Israel sold her letters for $100 each. The most famous literary forgers, like Clifford Irving, played for million-dollar stakes. Israel stuck to smaller game. She needed hardly any equipment beyond some vintage typewriters from a secondhand shop and a stack of biographies and collections of published letters. Then she plucked out the best lines, added a few innocuous sentences as padding and occasionally threw in one-liners of her own. Can you ever forgive me? is a line she put in the mouth of Dorothy Parker.Two of Israel s fakes made it into The Letters of No l Coward, published in 2007. So she tells us, at any rate, and probably it is true. Israel reprints both letters; she might have copied them from the Coward volume, but that seems like a lot of trouble.But who can be sure? The hard fate of forgers is that, even when they tell the truth, they find themselves caught like the boy who cried wolf. Illus. Edward Dolnick won an Edgar award for The Rescue Artist. His new book, The Forger s Spell, was just published by Harper.